Judo is a modern martial art derived from the samurai fighting arts of Jujutsu which developed in the Feudal Period of Japan’s history. 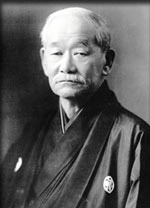 Professor Jigoro Kano, studied different styles of Jujutsu and eventually developed an art that adhered to modern physical education principles and coincided with the changing times in Japan. This modernized art founded in 1882 by Kano Sensei was given the name Kodokan Judo. ‘Ju’ means flexible or pliable. It implies a fighting system that allows its practitioners to be adaptable to ever changing forces at work and to use them to their advantage to throw or subdue an aggressor. ‘Do’ signifies a philosophical way to live life. So Judo means to live in such a way that you remain flexible with regards to situations that arise in your life and adapt to use them to your advantage.